Looking to have your exterior cleaned? Our speciality is cleaning and restoring exterior surfaces, we cater for all aspects from jobs as simple as blocked drains and gutters, a dirty driveway or patio, your homes render or a moss covered roof on your domestic property, we are able to help. 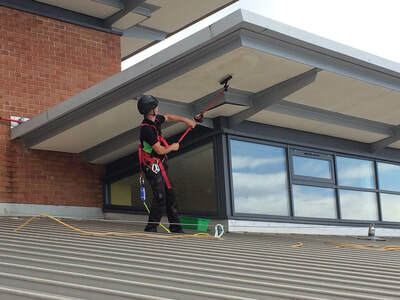 Not forgetting we also cover the commercial sector and work closely with many bigger clients for projects as such as full warehouse cladding cleans, carpark/block paving cleaning, commercial gutter cleaning/unblocking and even window cleaning, running a 24 hour service to cater for all of our clients needs and to minimise the disturbance and to suit operating hours. Our reputation has been built on the pure pride taken in each individual job undertaken and constant commitment to providing our clients with a 5 star faultless service. JetOWash have a high success rate with many repeat customers which is a testimony in itself, why not read some of our testimonials. "Had 10 year old block paved drive cleaned and resanded. Looks like new. Very pleased. Will definitely use again and recommend. Very reasonably priced too." "Dan and his team are helpful and efficient nothing too much trouble I would recommend JetOWash competitive pricing very professional." "We placed an order with Jetowash to carry out the removal of moss from our house roof. The two lads that carried out the works were fantastic , very polite and carried out a fantastic job, very tidy and the roof is now totally free from moss. I would not hesitate to recommend . "I used JetoWash for the first time today. I was impressed by the speed in which they reacted to my instruction, the thorough manner in which the work was carried out, and the modest cost. I would not hesitate to recommend the firm." 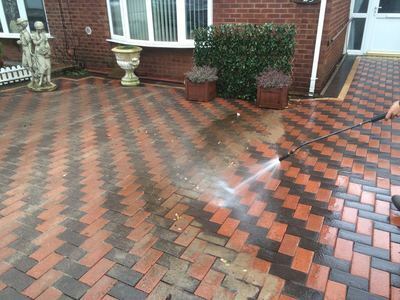 ​We are able to clean/restore many different types of block paving including but not limited to; concrete, clay and stone. Is your roof becoming over taken by Moss, lichen and algae?